Last Sunday, we noticed signs of activity in the former Magnolia Cafe storefront. On Wednesday, a tipster put us in touch with the General Manager of Emerald City Coffee, the independently owned cafe next to the Sheridan Red Line stop. 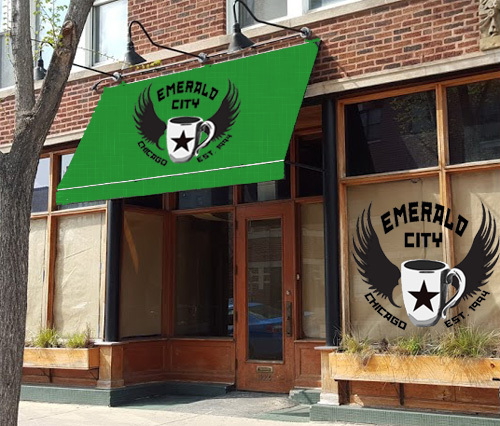 Brian Osborne confirmed that the lease has been signed and Emerald City will be opening a second location at 1224 West Wilson, hopefully as soon as early summer. Not only that, he plans to move the cafe's baking operations into the Wilson location, which will supply both stores with food and pastries. Emerald City has been around for more than 20 years, and Brian feels the time is ripe for expansion. Uptown, and Wilson Avenue, were appealing due to the full-service kitchen in the former restaurant, as well as a space that's practically turnkey-ready. (The storefronts on Wilson that housed Luna Cafe/Salon and Starbucks were also considered, but they would have required structural customization for the baking operation.) At 1224, he said all it needs is some paint on the walls, some bookcases, and new kitchen equipment, and it's ready to go. Another appealing aspect of the location is commuter foot traffic to the Wilson Red Line stop, something with which Emerald City is very familiar, since its current location is right next to the Sheridan L. Brian is considering putting in a "commuter walk-up window," but hasn't made a final decision. The new store is projected to open at 6am for the convenience of Red Line commuters. For those not familiar with Emerald City, it serves as a community hub as well as a coffee shop, with live mic nights, art displays, and cabaret acts. Brian envisions more of the same for the Uptown location, and hopes for it to be somewhere that people get their morning cuppa joe and feel comfortable hanging out after work. (He is considering applying for an "incidental" liquor license so that Emerald City can eventually serve beer and wine on-premises in the evening.) The extended storefront to the east of the main restaurant is projected to serve as a community room. 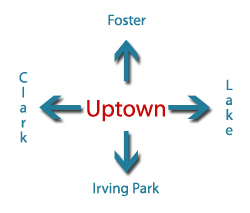 Brian would also like to see the Uptown store become a contributing part of the entertainment and music scene, a subject dear to his heart, since he hails from Austin, Texas. Truman College being right across the street was another factor in the decision to open a second location on Wilson Avenue. He has always wanted to have Emerald City located near a college campus, a la University of Texas at Austin, and sees students as "an energetic community." We had to ask: With the presence of five other coffee shops within a half mile (Starbucks at Target, Starbucks at Lawrence/Broadway, and three on Wilson -- Everybody's Coffee, Heritage Outpost, and Baker & Nosh), can Emerald City survive in such a competitive environment? Brian sees the independent coffee shops as complementary to one another, not as competition. He thinks each has something unique to offer, and sees them joining together to make Wilson "The Avenue of the Bean." He thinks all the indie coffee houses so close together can create a coffee destination spot not just for Uptowners, but has the potential to attract people from all over the area. After all, he says, "We're selling an experience, not just a cup of coffee." We look forward to meeting our new neighbors at Emerald City in a few months. Isn't there a liquor license there already?? I am excited. Hey Coffee Shops -- Two words: Margate Park. We're thirsty, we're friendly, and we're affluent. Come! Anna Marie's at Clark and Montrose is a great Italian place. I live closer to Winona and Marine Dr.. but I've heard good things about Anna Marie's. The coffee shops on Wilson are nice but small and hard to sit and work, which the Starbucks was great for. I have been in their other store, I look forward to the opening! I'm kinda tired of all the coffee shops close-by. 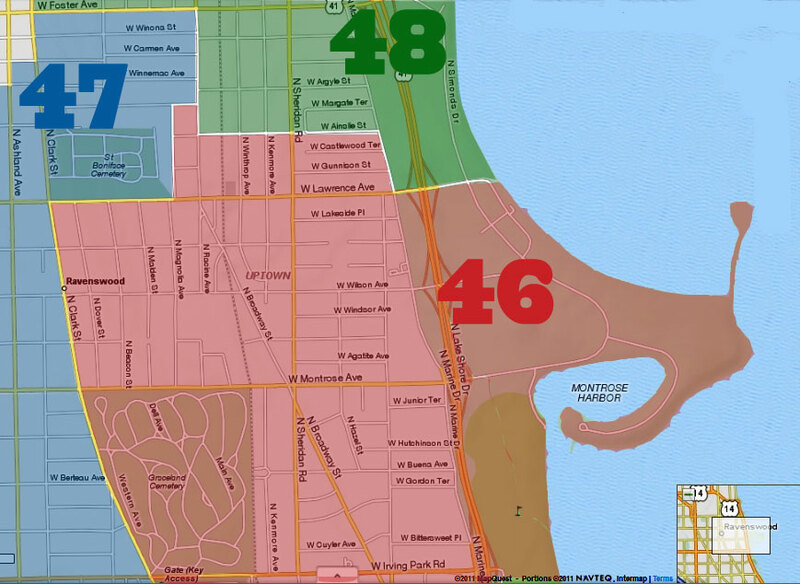 We need a variety of businesses in this area, not only coffee and baked goods. Students,faculty & staff at Truman College - acrossss the street from this location! - will fill it up. Starbucks made a big mistake closing their store on Wilson - Truman folks who used to be regulars do not go to other Starbucks. We will love giving our business to an independent place that appreciates us.